Hey! I'm in New York, which was kind enough to save its hot and muggy weather (a local specialty) just for BookExpo America. Woo-hoo! Last night I participated in the Teen Author Carnival, which was an amazing event the coordinators should be very proud of. There were sooo many fantastic authors I got to meet (and many I didn't). But the best part was meeting readers, answering their questions (on the panel and in person) and seeing how excited they are about books. Books! I'm told there might be copies of SHADE and/or the WVMP books available at this event, but it's not definite and I don't know if they'd be for giveaway or for sale. NOTE: I will probably be late to this one, but I will be there for at least the last half hour! That's right--they're free! Arrive early (3pm or sooner) to be sure to get one while supplies last. One autographed book per person. For attendees of BookExpo America only. It's especially nice because usually when one of my books comes out, I get a flood of, "WHY CAN'T I CAN'T FIND YOUR BOOK IN MY LOCAL STORE?!! R U A REAL AUTHOR OR NOT??!" messages. BUT there is a chance that if you go into your local bookstore, you might have a bit of difficulty finding Shade. Not because it's not there. A quick inventory on Borders.com and BN.com shows that almost every store has it in stock. But it might not be where you think it is. It might not even be where the "helpful" kiosk computer says it is. Because it's a new book, it could be in places that are designed to catch the eye of browsers, but not necessarily people who are actually seeking it. For instance, I went to the Madison Square Garden Borders on release day and looked it up on the computer. 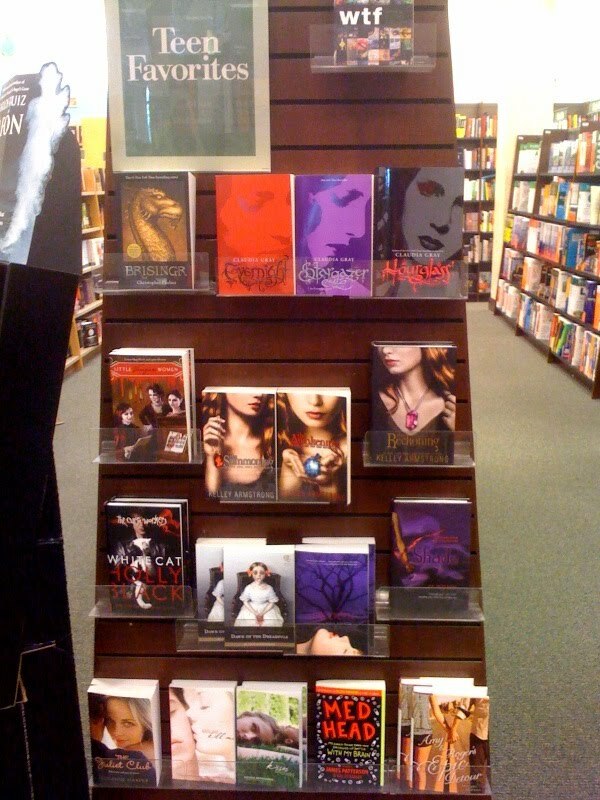 It said Shade was in stock and shelved with Young Adult Science Fiction/Fantasy/Horror. Giddy, I trotted over to that section and found no Shades. My heart sank. 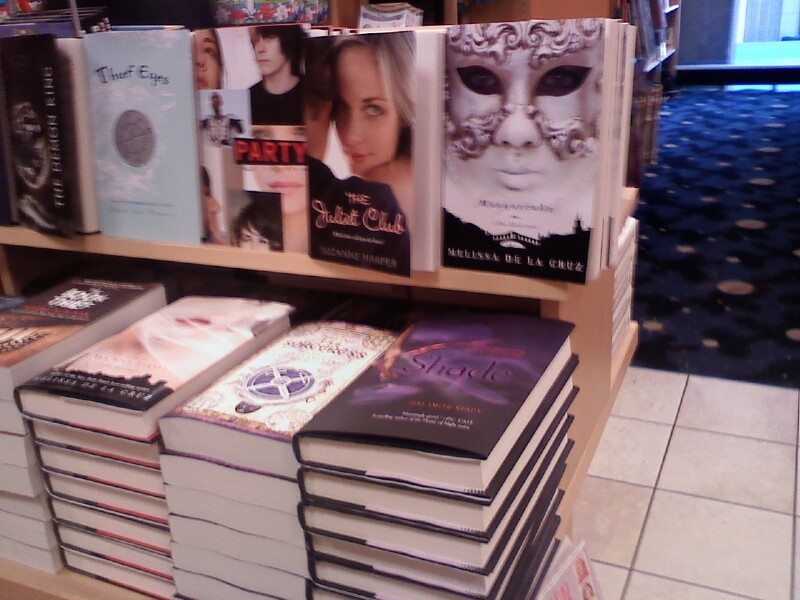 EDITED TO ADD: The ever-awesome Leah Cypess (whom I interviewed here two weeks ago for her release of Mistwood) was in the same bookstore yesterday and took this shot, of my autographed Shades on the Summer Reading table. It's part of Borders' Double Dog Dare deal, where if kids read 10 books, they get one free. Yay! So on Friday, when I went to another bookstore to sign stock (having checked the online inventory to make sure they had it), I looked everywhere--tables, endcaps, shelves. Nothing. My giddy was gone. I asked the helpful information desk dude, who looked it up and said that it was supposed to be on an endcap. Alas, we discovered that the copies were still in a box in the back stockroom. Due to understaffing, they hadn't had time to put all of last week's books out yet. So I signed them and he put them on--well, he couldn't find the "Autographed Copy" stickers, so for all I know they're still sitting at the info desk. See where I'm going with this? Shade is in stores, so if you can't find it, PLEASE ASK. Not only will you be more likely to get your copy, you'll raise awareness of Shade with booksellers. And I will love you. Just so you know, it took me several minutes to figure out what the third 'g' word in the title would be up there. I love alliteration, but the brain today is not so much, um, working. But I'm finally home--yay! I'm enjoying a day "off" in my sweats, catching up on e-mail and this weekend's guest blogs/interviews. Speaking of which, the internetz are being carpet-bombed with Shade-related fun! Which might be the first time "carpet bomb" and "fun" have appeared in the same sentence. On Sunday, I guest-blogged at Amberkatze's Book Blog about the Shade soundtrack, which can be found on the Shade music page and downloaded in its entirety from iTunes. I'm really proud of this one, because I tried to create a musical landscape of the entire book, not just the parts that had music in them. Ideally, the songs should take you through the emotional ups and downs of the novel, like a road leading through the story. Amberkatze is giving away an unsigned copy of Shade. Deadline: Sunday, May 9. International entries welcome! On Monday, I did a Big Idea post at John Scalzi's Whatever blog. I discussed some of the ideas behind the book, including the whys and hows of the red and violet. Since most of that deep thought stuff doesn't make it into the book (because that would be boring), this post was a chance to outline the book's thematic background and give a little insight into how I rose to the challenge of all that world-building. Yesterday, I blogged at the class of 2k10 on the place my main character calls home: Baltimore. In "City of Ghosts," I tell why I love that town and why it's the perfect setting for an urban fantasy. My Nana makes a brief appearance, too. Fantastic Book Review is giving away 5 unsigned copies of Shade, courtesy of my generous publisher, Simon Pulse. The contest links to a really fun interview and a stellar review. Deadline: May 13. U.S. residents only. 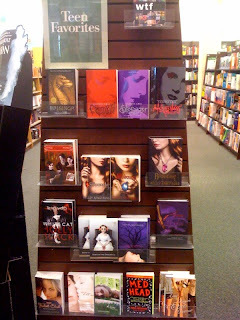 The third of three behind-the-scenes-of-Shade posts is now up at at TeenReads.com. Check out the "Story Behind the Story" to see what inspired me to write Shade. 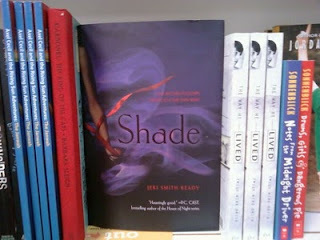 Fabulous YA author Elizabeth Scott is holding a contest to win a signed copy of Shade. All you have to do is tell her your favorite salad dressing. Mine's honey mustard, but she seems to attract a ranch-y crowd there at the blog. Deadline: May 7. U.S. Residents only. Fellow Class of 2k10 member Leah Cypess interviewed me for the Enchanted Inkpot blog. It's a really good blog community made up of those who write YA and middle grade traditional fantasy (as opposed to us grungy urban fantasy types). The variety of posts is really fun, so if you like fantasy, you should follow it. I do. This Saturday at 11am Eastern, I'll be chatting live on Blog Talk Radio's "A Book and a Chat" program, with the delightful Barry Eva. You can tune in live and ask questions, or you can listen to it later. Speaking of live, I'll be doing a live chat at FallenArchangel.com, the official fan site for Becca Fitzpatrick's novel Hush Hush. The chat will be on Monday, May 17, 9pm Eastern, 6pm Pacific. 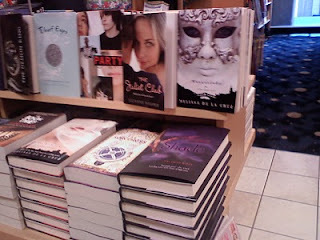 Shade is one of two featured books on FallenArchangel.com, along with Holly Black's White Cat, which I can't wait to read. It has con artists. 'Nuff said. More details to come, including a Shade giveaway! I saved the best for last: For What It's Worth blog is giving away ALL of my adult books this week in its "Fawesome contest" (the name comes from a term I coined after misreading one of my editor's comments in the margin of my manuscript). Deadline: May 9. International entries welcome! Whew...that's just a portion of the contests out there. Probably best just to Google "Jeri Smith-Ready Shade giveaway." I mean, even though you've already gone out and BOUGHT YOUR COPY (right? ), you can always use an extra one for a friend, family member, coworker, or random person you meet on the sidewalk. Now...the goodies! Did you think I forgot? Check out the Shade downloads page for widgets (like the one below, animated avatars (like the one at the top of this post), regular avatars for Twitter, LiveJournal, etc., and downloadable wallpapers for your computer. Soon there'll be Keeley Brothers swag so you can show your love for our favorite fake band! Hope to see some of you this Saturday at the Borders in Winchester, Virginia, 2-4pm. Reading at 3. Buy Mom a Mother's Day gift while you're there.